I just laid it all out there. I hadn't woken up and gone to a communication and teaching conference thinking that I was going to be so vulnerable with my colleagues, but when we were asked to give a 2 minute talk on any topic of our choice, I knew I had my topic. "NO LIMITS." I started by saying that I wanted to share my journey with Down Syndrome, and to convince them not to limit their expectations of people who have DS. I told them my theme was NO LIMITS. This is totally a popular tag line in the DS Community, but they had never heard it before. As I told them that we had found out at 10 weeks in utero that our daughter had DS, and that she was a girl, I started to realize that I might just cry while I told my story to my coworkers. But it was too late--I had already started my story. With a voice that started out strong and quickly became shaky, I told my colleagues that my initial response to the diagnosis was to think that my daughter would never go to college, wouldn't be that smart, and would have tons of medical problems. I told them how we found out that our baby girl had holes in her heart. I smiled when I said that as we processed and learned more, we found out that there were people with DS who had PhD's, were champion swimmers, musicians, lobbyists, entrepreneurs, and so much more. There was a palpable relief in the room when I smiled. A couple coworkers told me later that they wanted to cry too, but that when I smiled, they could breathe with me. I almost lost it when I said that Evie was taken away from me right after she was born because she couldn't breathe, and then spent 6 weeks in the NICU. Apparently I still can't say that without tearing up, 16 months later. I shared about how she couldn't eat enough because of the holes in her heart, and that she now has a feeding tube. 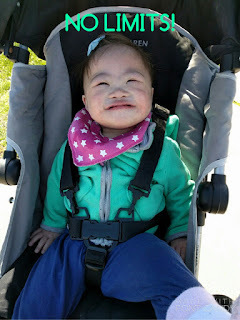 The best part in the storytelling for me was sharing that Evie has surpassed my expectations in many ways, even if she had an extra copy of the 21st chromosome. The example I gave was that we were told that she wouldn't crawl for a very long time, and she is now already crawling across the living room. I was excited to see what else Evie will show us she can do. As I finished, I asked my audience of optometrists to remember to place NO LIMITS on people with Down Syndrome, and to enjoy interacting with them as they would any other person. When I finished, I was pretty much shaking. I had laid it all out there and bared my soul to my coworkers, with whom I'd rather appear unflappable. I had no idea if I had just stunned them all, and just babbled for 2 minutes. But they were awesome. They told me that they wouldn't change a thing about how I had presented it, and that I could have been doing a PSA for people with disabilities. They told me that they felt pulled into my story and were inspired. And they said that they were glad that I had acknowledged how I had initially felt about Down Syndrome so that they could also realize that they needed to be more aware. I felt validated by my colleagues, and most importantly, I felt like I had done my share of raising DS awareness for the day. Even though it totally drove me out of my comfort zone, I knew there was no way that I could pass up sharing my story in the hopes of helping a few more people to understand that the future is bright and unlimited for kids with DS. And in the process, I found out that there are no limits for me as Evie's mommy either. NO LIMITS! Wow. So inspired by you and Evie. Oh, Amy...you and Erick are two of my heroes...along with Evie, of course!